Luckily, horrible plane seats aside, Jon and I had a fab time in Hong Kong. Because we were there for so brief a period, we relied exclusively on food tips from close friends who either lived there until just recently or who visit there often for work. 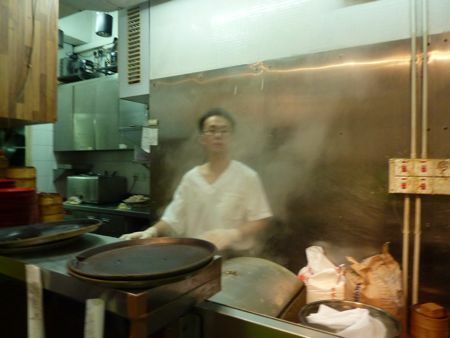 We ate four outstanding meals in Hong Kong, and for that, I give many thanks to Cathy, Bobby, Phu and Aaron. Jon and I arrived on a Sunday, around lunchtime. Because we wanted to make it to dim sum during proper dim sum hours, we took the unusual-for-us step of avoiding mass transit, and instead we took a taxi to our hotel in Causeway Bay. It was an easy and scenic 40-minute ride, costing 370 HKD ($48 or £30 at 8 HKD = $1 and 12 HKD = £1). First stop: Lei Garden Restaurant. The West Kowloon branch in the Elements Mall. A must for dim sum, said our friends. True that. Don’t be put off by the fact that there are numerous locations in Hong Kong, Macao and Singapore. While I can’t vouch for this Lei Garden being the best of all the Lei Garden locations, I will say that the dim sum we had was outstanding. All the classic dim sum dishes were represented; ingredients were great quality and fresh; everything was well made; decor was chic and comfortable; and we were surrounded by large groups of Chinese-speaking family and friends catching up over good food. The true spirit of dim sum. Shu mai was especially memorable — flavorful without being filled with fat, as is too often the case with shu mai. 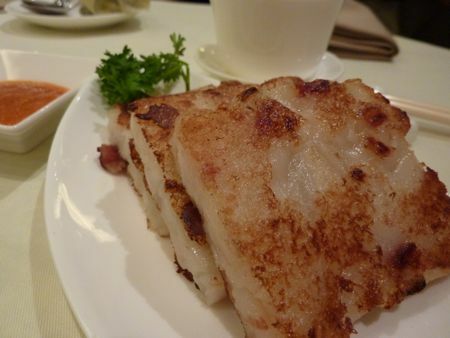 The loh boh gau (radish cake) was thoroughly perfumed with pork and turnip and had a perfect crisp to the exterior. Prawn cheung fun also deserves special mention for its silky-but-firm noodle and sweet, perfectly-cooked prawn and celery filling. Jon and I didn’t see any unusual dim sum dishes on the menu, but if we lived in Hong Kong, we’d be here every weekend. Of course we over-ordered and had 8 dishes, costing us 264 HKD total ($34/£21). West Kowloon Lei Garden Restaurant; Second Level, Elements Mall, No. 1 Austin Road West, Tsim Sha Tsui, Hong Kong; +852 2196-8133. Closest metro station (which even has an exit directly into the Elements Mall): Tsim Sha Tsui (red line). Our second stop: Tsim Chai Kee. 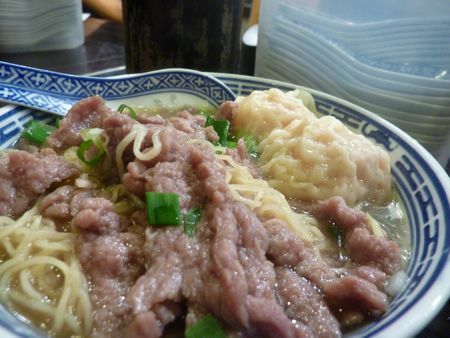 When I think of Hong Kong food, dim sum and noodle soups jostle for prominence. Tsim Chai Kee sits across the street from the more-famous Mak’s noodle shop near the start of the Midlevels escalator. Jon and I were told by different sources that Tsim Chai Kee’s noodle soups were bigger, tastier and cheaper than Mak’s, and although I can’t weigh in on Mak’s, I feel confident arguing that Tsim Chai Kee serves a best-in-class Hong Kong noodle soup. The restaurant is small, so expect to share your table with strangers. You get a choice of noodles (the thin, yellow egg noodles are the classic and TCK’s version were wonderfully al dente, rather than rubbery like they often are in London), and a choice of toppings. A soup with one topping is 17 HKD ($2/£1.40). With two toppings, it’s still a bargainous 22 HKD ($2.80/£1.80). We ordered a soup with just prawn won tons and another with beef and won tons. As if the sweet, plump prawn won tons and the tender slices of beef weren’t enough of an attraction, the soup broth was wonderfully meaty and fishy. Go. 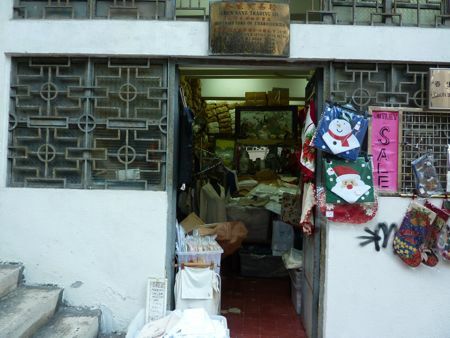 Tsim Chai Kee, 98, Wellington Sttreet, Central, Hong Kong (close to where the Midlevels escalator begins). According to TCK’s business card, there’s another location at 153 Queen’s Road Central, and an associated noodle shop called Yeung’s Noodle at 219 Hennessy Road, Wanchai, Hong Kong. I first got the idea to visit Tim Ho Wan after reading Hollow Legs’s June 2010 post about it. 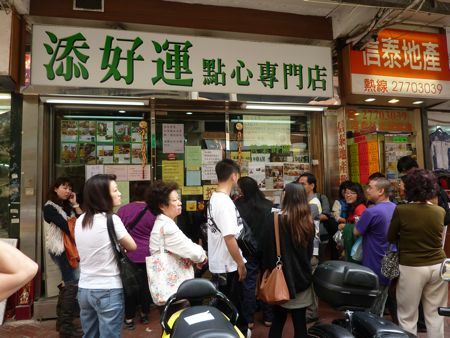 A Michelin-starred, divey, no-reservations-taken dim sum place in HK? This I had to see. Hong Kong friends warned me about the queues but recommended I put my name down, take a deli-counter-style number from the lady manning the door, and then wander around the nearby Ladies Market until my number was called. With a few hours to myself one afternoon, I figured that I could avoid Tim Ho Wan’s infamous queues if I if I showed up as a party of 1 on a Monday afternoon at 2 pm. Nope. I still waited 45 minutes, which was fine. I spent that time bargaining down the price of dozens of pairs of chopsticks at the Ladies Market, which was enormously entertaining. The beauty of dining alone at divey restaurants like Tim Ho Wan (whose press, ironically, seems to have originated from the chef-owner’s background as the former dim sum chef at the Hong Kong Four Seasons hotel) is that the resto will automatically seat you with other solo diners. I sat with a local Hong Kong man who had *taken the day off from work* to eat here because apparently the queues on weekends are just too insane to bear. In any event, I was pleased to have someone with whom I could share (maximize) dim sum orders. And it was nice to hear Tim Ho Wan enjoyed fame among locals. First up: Tim Ho Wan’s signature dish: “baked BBQ pork bun.” A twist on the classic char siu bun, but here, instead of using a steamed bun, a crispy, sugary biscuit-like exterior is used. This was very tasty, but rich. It’s the offspring of a buttermilk biscuit and a char siu bun. I can see why it’s popular but feel sorry for the poor soul churning out thousands of these every day. 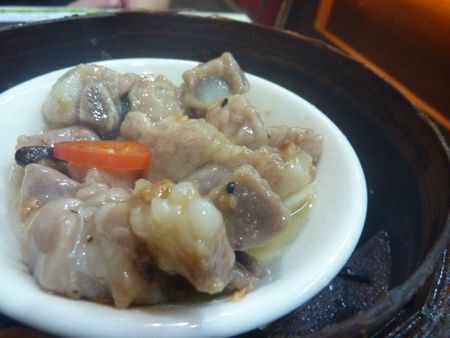 The other standout dishes I ordered were the steamed spare ribs in fermented black beans and the fried beef balls. The spare ribs had a great kick and a perfect ratio of meat to fat. Not too gloopy. Beef balls were impossibly tender. Great examples of classic dim sum dishes. Everything else I tried – pan-fried turnip cake (loh boh gau), sticky rice dumpling and beef cheung fun – was good, but not any better than what I’d had the previous day at Lei Garden. Overall, I’d agree with everyone who says that there is delicious dim sum to be had at Tim Ho Wan, but I reckon there’s equally good dim sum all over Hong Kong. I definitely have no idea why Tim Ho Wan has a Michelin star. People who depend on the Michelin guide to give an approximation of the level of service, decor and cooking they can expect from starred establishments . . . well, let’s just say Tim Ho Wan would drive such people mad. In any event, the food there is indeed good quality and very cheap, with very few dishes costing more than 12 HKD (or $1.50/£1). 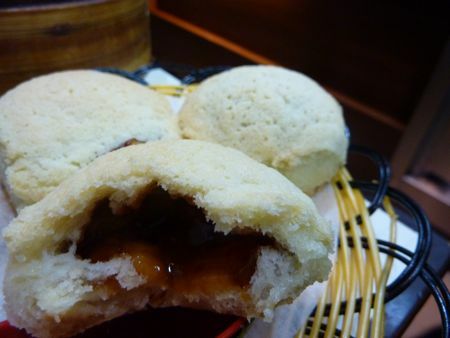 Tim Ho Wan is open daily from 10am-10pm. Shop 8, 2-20 Kwong Wa Street, Mong Kok, Kowloon (00852 2332 2896). Closest metro: Yau Ma Tei (red line). Under Bridge Spicy Crab Restaurant was where Jon and I had our last meal in Hong Kong. I was skeptical and wary when I saw multiple photos of Anthony Bourdain plastered all over the restaurant facade. But the restaurant’s signature dish, spicy shelter crab, was outstanding. 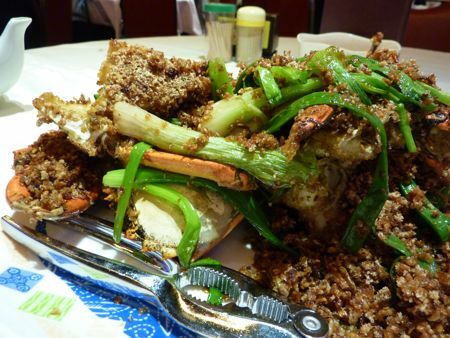 The crab was sweet, but the best part is the garlic-salt-chili crust the crab is fried in. The other stuff (clams for 60HKD and sauteed chives, 39 HKD), was forgettable. With two drinks, we paid 560 HKD ($72/£45) total, with most of that cost being the crab, which was worth every penny. In fact, when you’re finished with the crab meat, the fried garlic-chili is addictive with white rice. For a super-complete point of view on this place, read this May 2010 Follow Me Foodie blog post. Under Bridge Spicy Crab Restaurant, 414-424 Jaffe Road, Wan Chai, Hong Kong; +852 2834 6268; closest metro: Wan Chai or Causeway Bay (blue line). It’s no secret that Hong Kong is a shopper’s paradise, but bargains are hard to come by these days. For anyone looking for table linens, though, I highly recommended Chun Sang linens in the Midlevels. Overlook the horrible store facade and try to ignore the horrific merchandising (or lack thereof). Show up with your table measurements, and the shop keeper can find you anything. Gorgeous linen tablecloths for less than £50. We combined our shopping trip with the obligatory ride up the Peak Tram, whose terminus is nearby. 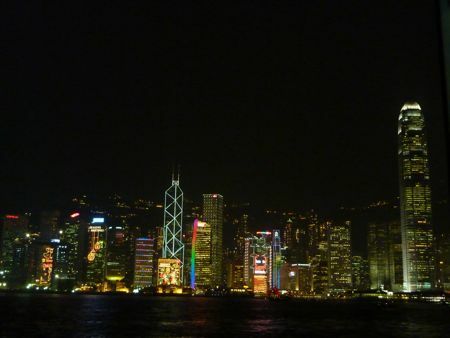 Great post and you’re making me yearn for HK. I’ve never been to any of the branches of Lei Garden in HK but I have been to one in Singapore, where the dim sum was the best I’ve had ths year. I also think I’m right in saying that most of their HK restaurants have a Michelin star – if that, as you point out, actually means anything in HK! I’m also loving the noodles – how I wish I could get hold of them in London. On the spicy crab, that’s another favourite of mine but I’d save the garlic-chilli bits for some plain juk (congee) rather than rice. A great 48 hours and I’m so envious! Super envious of this trip – sounds fantastic and great tactics on getting a table at the Michelin starred dim sum place. Wonder if they will put their prices up to try and get rid of some of the crowds and capitalise on the star? @Jean – Hope the tips are useful. Report back! @Gourmet Chick – Interestingly, while there are a lot of press clippings in the window at Tim Ho Wan, I didn’t see any Michelin references. It’s like they don’t care? In any case, much as I liked THW, it shouldn’t have a star. PS. Where did you stay in Causeway bay? @Kay – We stayed at the Mandarin Oriental Excelsior, which is def a business hotel (i.e., not super luxe or unique, but comfortable). The location and service were great, but it was low on charm. We paid £200 a night, which I thought was a pretty good rate for HK. Again, jealous jealous jealous. My mother–who knows nothing about dim sum–still says the best meal of her ENTIRE LIFE was when my father took a nap at our hotel and she and I went down to the dim sum restaurant at the Regal Kowloon. Wow! Thanks so much for the link back! So you noticed I tend to write a lot on my posts huh? lol… I really do love that crab! You have a great blog going on here and I totally love this article. The Baked BBQ Pork Buns are one of my favourite dim sum items. LOVE those! 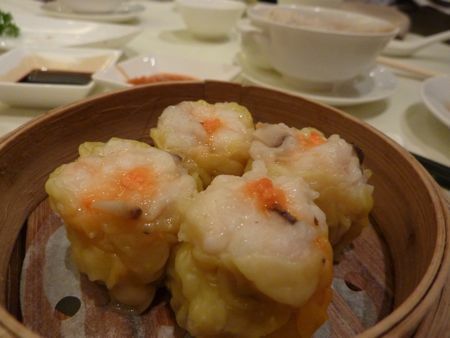 You should visit Vancouver – we have excellent dim sum! Thank you again for linking back to me, I really appreciate it! Cheers! @Krista – That must have been fun to visit HK with your mother. I mean, she may not know much about dim sum, but it’s great she’s visited HK, yes? “It’s the offspring of a buttermilk biscuit and a char siu bun.” Yes please. What a fantastic write up- Haven’t been to Hong Kong in 10 years and now am itching to get back. Maybe on the way home to Sydney sometime…. The last time I flew on Cathay Pacific was in 1996 (! ), and back then, it was a premium experience. This time around, the service and food were still pretty good, but those seats – ugh. Horrible.